Yes, you read that right Germany's 2017 Confederations Cup-winning campaign in Russia sadly led them to a howler of a World Cup performance in Russia, 2018. Prior to the tournament, Germany entered the competition as strong favourites even though they didn't win Euro 2016. But their World Cup-winning campaign ensured they qualified for the 2017 Confederations Cup, a club world cup of sorts in the international stage. Eyeballs were raised when Germany omitted star players like Mesut Ozil, Thomas Muller, Jerome Boateng, Manuel Neuer and Toni Kroos. In their place, Low had brought with him to Russia youngsters such as Serge Gnabry and Max Meyer. Another surprise was the inclusion of exciting prospects, Hoffenheim playmaker Kerem Demirbay and Ajax Amsterdam striker Amin Younes. Low named 23-year-old PSG midfielder Julian Draxler as team captain. In other words, Germany chose a B-Team or even a C-team for the competition where most teams fielded their best players. Chile made just one change to the team that beat Argentina (boy, that's a good habit) in the Copa America final and almost the same team that beat Portugal the present 2016 Euro Cup Winners in the Confederations Cup. 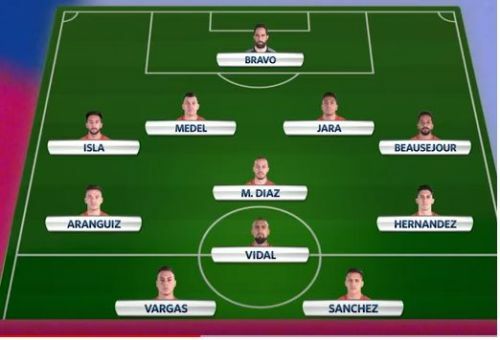 Just like Arturo Vidal said most people would have considered Chile the best International team of that time if they had beaten Germany in the Confederations Cup Final. A very big 'if' that turned out to be as Marcelo Diaz gave the ball away to Lars Stindl who went to score the one and only goal of the game earning one of the best teams of the tournament just silver medals. Germany shocked the world winning an international competition with their B team establishing their dominance in a tournament where most teams played all their best players. They looked unstoppable and ready. Everyone thought 2018 could be the year a national team would win successive world cups since Brazil and Italy in the 20th Century. Fast Forward to 2018 Russia, Joachim Loew recalled Marco Reus and other major players but started Werner, Hector, and Draxler who by this time had been instated to the main team to play in the biggest International stage. Two among these under-performed, especially the confederations cup campaign captain. Leon Goretzka started his first game of the tournament, thanks to a very poor campaign from German mainstay, Thomas Muller. Usually, behind Werner, it was a selected combination of 3 of Ozil, Draxler, Reus and Muller. Draxler even though a very good dribbler came out to be too predictable for oppositions. Thomas Muller uncharacteristically scored 0 goals this world cup campaign, the one thing he is very good at. Analysts always study players like Thomas Muller and what makes them tick, I still remember FIFA video game developers upping his overall in one edition but his individual attributes never stood out. One thing he's really good at is poaching goals, but sadly this tournament is an experience he will be quite eager to forget. Goretzka played well given when he was given the nod. Ozil made defense splitting passes whenever he could but the forwards never finished even with much more chances than Korea. Reus looked like a shadow of himself, Toni Kroos looked enthusiastic, eager and desperate but uncharacteristically inaccurate as a result hitting way too many shots off target rather than looking for a killer pass from distance. Werner had a nightmare of a day, not for the lack of trying though, but his deliveries and shots in the final third horrendous even though he caused a lot of problems to the defence. Hummels' lack of pace was exposed a lot of times even though he makes it up most of the time due to his excellent positioning. You might be wondering why I'm just writing about just this match. Well, almost all the 3 matches had the same summary except for a few changes like Kroos and Reus masterclass in the second match vs Sweden. It was a brave call to play the captain Manuel Neuer after coming back from a lengthy spell in the sidelines and arguably it didn't go wrong but his mistake which eliminated Germany surely from the competition was humiliating for himself. I have always seen Neuer charging and sweeping, it looks so good when it works out but you look like a fool when it doesn't. I just don't understand the need for Keepers like Neuer to be in the opposition box to try to head in a corner when you have never scored a header from a corner in your professional career. I have seen around 300 matches live on tv and never have I seen the goalkeeper score a header. Obviously, it wouldn't have saved Germany from their exit, but it would have eased the humiliation. Germany dominated the match for 85 or more minutes and South Korea with forwards who just wanted to go home score two goals on the counter. Trust me the South Korean Defenders and Goalkeeper played their heart out. But barring the defence, the South Korean team were pretty demotivated. A few of the reasons why I supported Germany was their tactical fluidity, resilience and mentality. Joachim Loew overall has done an excellent job as National team Coach fielding players in either a 4-2-3-1 or 3-4-3 system. But this time, it was a tournament to forget for the manager, he relied too much on players like Thomas Muller, Julian Draxler, Manuel Neuer, Mesut Ozil and Timo Werner. The German, albeit whoever they fielded this time, were too predictable and lacked chemistry. They played a Mourinho-esque siege mentality with the 4-2-3-1. This is probably the first major international competition where the likes of Ozil, Khedira, Kroos, Muller played together with the likes of Timo Werner, Leon Goretzka, and Draxler. Most of these players don't play together with each other often in the national team setup. The whole team selection looked like an impromptu one going by the performances on the field. As much as the players are guilty of being too lax vs Mexico and too desperate vs Korea in the final minutes, the coach should take responsibility for the team selection and for not starting a fast and explosive player like Julian Brandt after his competition debut vs Mexico as a substitute. The kid was the brightest spark and only positive for Germany in the competition. In a slow-paced team like Germany, Julian Brandt literally showed the ineffective Draxler how to make an impact whenever he got the ball. He hit the post multiple times showing the misfiring Striker Timo Werner how and when to shoot. This time, Loew didn't look like he had a plan B, he just had a pretty decent Plan A and that failed badly. He started all the matches with the same system and approach underestimating the opposition teams. That's where the trouble began. Germany struggled against a fast-paced Mexico, a deep defending South Korea who didn't look like they wanted to win, and just managed to scrape past a very good Sweden team but by no means that was accidental, that was a silver lining among the dark clouds. In a group with Sweden, South Korea and Mexico, one would be nuts to predict Germany would go out in the group stages with their team 'Die Mannschaft' before the competition, well that's exactly what happened. That's what makes this game exciting. 2018 World Cup has been a competition for the underdogs, the dark horses, the minnows, rightly and aptly so. As Patrice Evra rightly puts it multiple times, "I LOVE THIS GAME"